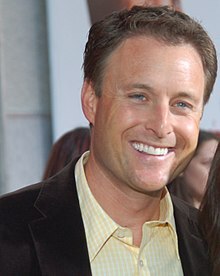 For other people named Chris Harrison, see Chris Harrison (disambiguation). Christopher Bryan Harrison (born July 26, 1971) is an American television and game show host, best known for his role as host of the ABC reality television dating show The Bachelor since 2002, and its spin-offs The Bachelorette since 2003, Bachelor Pad from 2010 to 2012, Bachelor in Paradise since 2014, the first season of Bachelor in Paradise: After Paradise in 2015, Bachelor Live in 2016, and The Bachelor Winter Games in 2018. He has also served as the host of the syndicated version of Who Wants to Be a Millionaire? since 2015. Harrison was born in Dallas, Texas. He graduated from Lake Highlands High School in 1989. He attended Oklahoma City University on a soccer scholarship. He was a member of the Kappa Sigma fraternity. From 1993–99, Harrison worked as a sports reporter at CBS affiliate KWTV in Oklahoma City. He also worked briefly for TVG Network, a horse racing channel, and was the host of Designers' Challenge on HGTV. In 2001, Harrison hosted the short-lived game show Mall Masters for GSN. In 2002, Harrison guest-starred on Sabrina, the Teenage Witch, as a music show host, in the episode "Ping, Ping a Song". On November 23, 2008, Harrison hosted the American Music Awards pre-show live on ABC. His co-hosts were Dancing with the Stars judge Carrie Ann Inaba, and Pussycat Dolls member Nicole Scherzinger. The TV Guide Network, now known as "Pop," announced that Harrison was signed to anchor its live red carpet awards coverage, beginning with the 2009 Primetime Emmy Awards in September. In 2011, Harrison and Brooke Burns co-hosted the game show You Deserve It. He has also co-hosted Hollywood 411 on the former TV Guide Network. He has hosted Designers' Challenge on HGTV and Mall Masters on the Game Show Network. In April 2015, Disney-ABC announced that Harrison would replace Terry Crews as host of the syndicated version of Who Wants to Be a Millionaire? for the 2015–16 season. GSN began airing reruns of this show on December 18, 2017, marking a return to the network for him since the cancellation of Mall Masters. Harrison currently hosts ABC’s The Bachelor and The Bachelorette". He was married to his college sweetheart, Gwen Harrison. They have two children, Joshua and Taylor. In May 2012, after 18 years of marriage, Harrison and his wife announced they were ending their marriage. ^ a b "Chris Harrison". TVGuide.com. Archived from the original on September 27, 2015. Retrieved July 21, 2015. ^ "Notable grad: Chris Harrison – Lake Highlands High School class of 1989". lakehighlands.advocatemag. February 22, 2018. Retrieved March 12, 2018. ^ "Chris Harrison - The Bachelor". ABC. ^ "Chris Harrison Named New Host of 'Who Wants to Be a Millionaire?'". CloserWeekly.com. April 14, 2015. Retrieved February 5, 2017. ^ Tim Molloy (29 July 2009). "Carrie Ann Inaba, Chris Harrison Join TV Guide Network's Red Carpet Coverage". TVGuide.com. Retrieved 2009-07-29. ^ Nellie Andreeva (13 April 2015). "Chris Harrison Named New Host Of 'Who Wants To Be A Millionaire', Replacing Terry Crews". deadline.com. Retrieved 2015-04-13. ^ "Bachelor Pad Host Chris Harrison: King of the Rose". People. ^ a b "Chris Harrison, Wife Gwen Are Splitting". People.